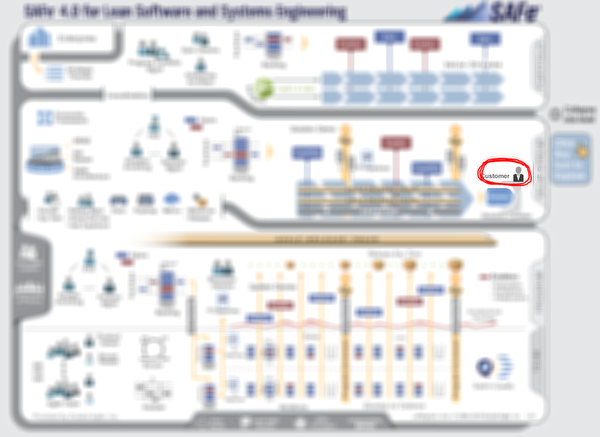 If you never have had a look at the scaled agile framework, you may want to do so. It’s has some really good concepts in it. Still with all the enthusiasm I feel like being drawn back to the good old times of software engineering. And you know why? Did you find users or customers and collaboration with them? Can you spot user in SAFe? If not, you know what’s to fix. Here by the way the two graphs from the rational unified process I used more than fifteen years ago to point out the major flaws of software engineering at that time. Do you find any resemblance? Can you spot the user on these pictures? they must be here somewhere because that is the requirements engineering process. The rational unified process had stakeholders under additional roles just sorted after any role, users are not even mentioned. In SAFe, customers are just where the release train ends, users are nowhere to see either. Is creating products really just about release trains, value streams, features and that stuff? We still behave as if the big challenge of creating great and successful software products was to manage the work packages for the development teams! The teams I’ve seen really struggled to establish a tight and fruitful collaboration with their customers and users so they would build software with higher value rather than delivering mediocre features more efficiently! How will we ever be able to successfully develop software if we completely ignore the key factors of our success, i.e. our market, the customers and our users? There is still a lot to learn. And it seems that in spite of all agile methodology, we are very reluctant learners. See e.g. Pete’s post: http://starstoroad.com/blog/?p=706. A bit more common sense than large frameworks would really help the world. Successful organisations have an efffective feedback loop with their customers. This entry was posted in 07 - Daily hassles and practical philosophy and tagged Focus on Users, RUP, SAFe by markus. Bookmark the permalink. My favorite answer of course is reply 1. Just look at the picture.